Montreal Canadiens: Who Gets a Shot with Deslauriers Out? Which Canadien Gets a Shot with Deslauriers Out? Opportunities tend to present themselves during the preseason, both to prospects looking to make a name for themselves and fringe NHLers trying to stay in the show. 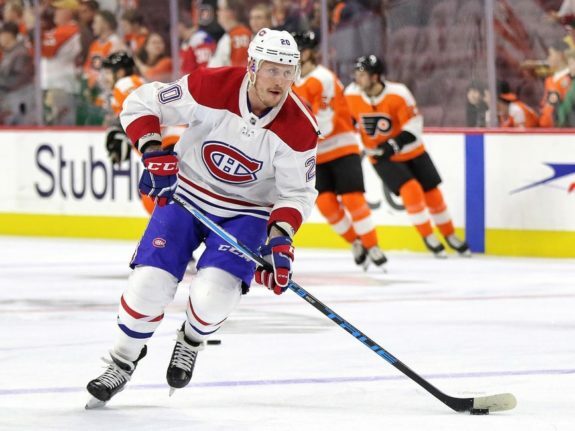 Sometimes, in Montreal Canadiens forward Nicolas Deslauriers’ case, those opportunities come about at the expense of others. The facial fracture Deslauriers suffered in a fight highlighted an unfortunate reality of preseason hockey. Serious injuries are an ever-present danger, even in a meaningless game, which the contest in question, against the New Jersey Devils, was, at least for Deslauriers. As a hometown kid who has ingratiated himself to fans with his high effort level, Deslauriers’ roster spot in 2018-19 was realistically never in doubt. It’s ironically his willingness to drop the gloves that has helped secure his status as a fan favorite. He also showed a capability of putting the puck in the net, with a career-high 10 goals last year, albeit thanks to an unsustainable 13.0% shot percentage. The two-year $1.9 million extension he signed last season is proof the Habs have the 27-year-old in their future plans, too. In the immediate future though, with Deslauriers injured, the Habs are going to have to come up with a new one on the fly. Coincidentally, Deslauriers got injured just as Paul Byron was returning from off the shelf ahead of schedule. So, technically, Deslaurier’s spot goes to him. The two are both left-wingers, after all. As a result, the status quo kind of remains intact, but, seeing as Byron was initially set to return sometime soon after the start of the season anyway, it still leaves a spot open with Deslauriers out indefinitely. Assuming the Habs go with the traditional seven spots for defensemen (and two for goalies), that would leave 14 for forwards. That’s excluding one for the injured Andrew Shaw, who himself is scheduled to return at the end of October. Ten of those spots should be guaranteed to NHL regulars up front: Byron, Joel Armia, Phillip Danault, Max Domi, Jonathan Drouin, Brendan Gallagher, Charles Hudon, Artturi Lehkonen, Tomas Plekanec and Tomas Tatar. That means four spots realistically remain for guys like fringe-NHLers Byron Froese and Michael Chaput, the upstart Matthew Peca, blue-chip prospects like Nick Suzuki and Jesperi Kotkaniemi and the handful of Habs prospects who have yet to establish themselves in the NHL. That last group consists of Nikita Scherbak, Michael McCarron, Jacob De La Rose and Hunter Shinkaruk, each of whom the Habs would risk losing by cutting them as they are waiver-eligible players. The easy decision is for Peca to stay, based on his impressive showing in camp and the one-way contract to which Habs general manager Marc Bergevin signed him. Another easy decision, is for Chaput and Froese to be waived, all due respect to them, to make room for three prospects in whom the Habs probably have invested more, emotionally and with regard to their development. Jacob De La Rose is probably a gimme based on a variety of factors: His strong preseason play, which has yielded two points in two games, and his defensive awareness, which the Habs have traditionally fawned over. As his ceiling isn’t as high as someone who would need top-six ice time to succeed, he’s a virtual lock to make the lineup. In contrast, Scherbak would need the ice time as he’s seen as a top-six forward in the making. 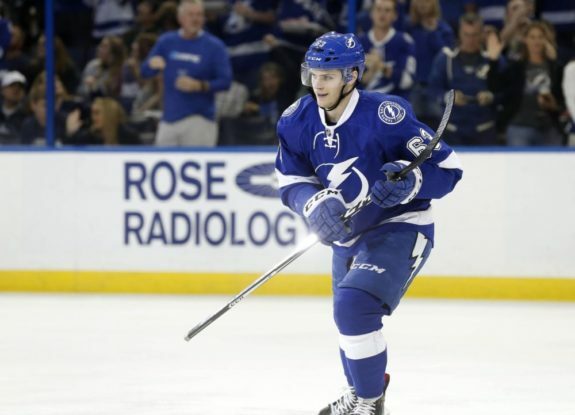 He too has had a strong preseason (two goals) and will probably stay too after his dominant showing in the American Hockey League last year (30 points in 26 games) if for nothing else than to assess if he can translate that success to a regular role in the NHL. A later trade may be in order if it’s determined he can’t. Between Shinkaruk, who was just recently acquired for Kerby Rychel, and McCarron, who was drafted by the Habs in the first round of the 2013 NHL Entry Draft, the latter probably has an edge. Shinkaruk was actually taken one spot earlier in that first round (by the Vancouver Canucks) and, while both are on the precipice of being labeled career minor-leaguers, McCarron is a 6-foot-6, 230-pound behemoth who is theoretically better-built for the bottom-line role that might be available. Between Suzuki and Kotkaniemi, arguably the Habs’ top two prospects, it’s almost a toss-up. Suzuki has the age and North American-experience advantage. Kotkaniemi has more hype surrounding him, though. Looking at how the Habs are expected to fare this coming season, which isn’t well, it’s not necessarily about who will be most effective between the two. It’s more about showcasing the young talent to come, even if only for just nine games, before the first year of their respective contracts comes into effect. As such, Kotkaniemi, who is earning rave reviews at camp thus far, probably has more of an inside track. The logical decision would be to take McCarron over Kotkaniemi. McCarron would be exposed to waivers and, because of his size and pedigree, would stand a good chance at being picked up by another team. Kotkaniemi, of course, isn’t waiver eligible. However, few could blame the Habs for going down the road less travelled and making the emotional decision to keep Kotkaniemi. It may even prove to be the wiser long-term decision. 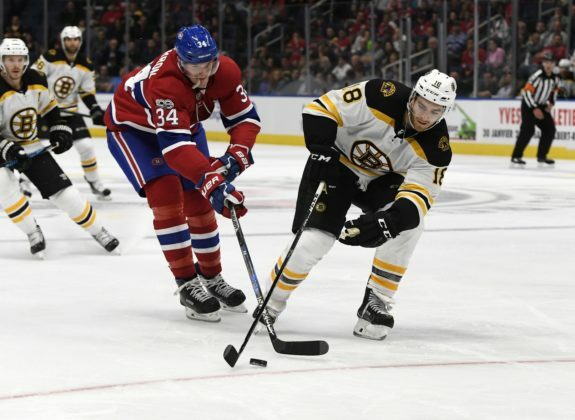 Yes, the Habs may lose McCarron if he were to get exposed, but, if he isn’t cut out for the NHL, they’d be losing a forward destined for the AHL… or lower. The NHL is a business and part of that business involves keeping fan interest up, which is probably why the Habs’ have gone on record as saying they will try to make the playoffs, when that doesn’t seem like a plausible goal, to be kind. 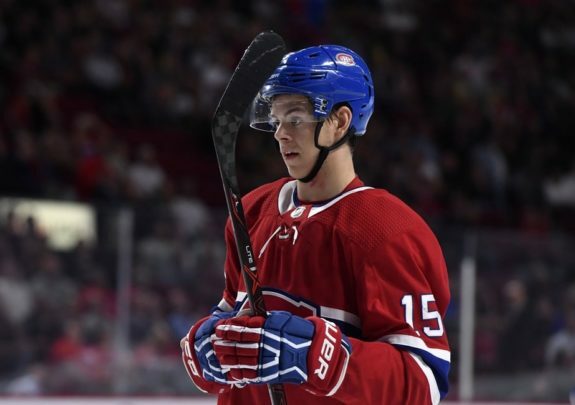 As a result, look for Kotkaniemi to make the team out of training camp and be in the Habs’ opening-night lineup. He was already put in a position to take advantage of the suspension to Domi, after all. He’s also the best candidate to keep Deslauriers’ spot warm, as he’s not a risk to want to stay on for the rest of the season. The Habs will want to walk a perfect balance between shielding Kotkaniemi from the turmoil to come and giving fans someone to look forward to. Thankfully, Deslauriers’ spot isn’t at risk, as he’s already been proven to fall into the latter category.